After the trip of a lifetime to Las Vegas (Editor’s note: see Adriana’s previous article) I’ve returned to my routine as a teacher and as a part-time poker player. 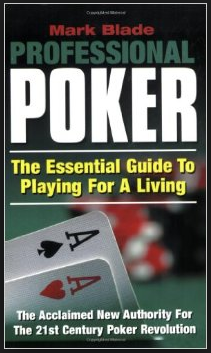 I was ready to read something fresh and I picked up an amazing book that I recommend to anyone thinking of taking poker more seriously. Mark Blade is a poker player and an author who helps you understand exactly what you are looking for and more importantly, if you have any chance of realizing your dream of playing poker for a living. To be a poker player you need to commit to living a lifestyle where you devote a big part of your days and nights, breathing poker. As Blade says, to be a good player it’s not sufficient to play well, but you must study the game, every single thing you do, in order to avoid mistakes. If you are going to play like me, you still need to use your time wisely. You must do whatever you can to be better. It’s not enough just to play for fun and recreation anymore. Consider poker as a job and in any job, you need to improve your skills to be the best you can. Blade talks about bankroll. It’s mandatory to have a full understanding about that subject since it’s the basis for everything. When you play with a small bankroll, you probably will play with fear or not at your best. You must be sure you are comfortable with your stack. Only this will help you make good decisions. Do the math! Imagine how much money you expect to earn and how many hours do you have available to do just that. Remember to include your study hours in this calculation, since studying is one of the most important things you can do to become a winner. Another point to consider as you plan your life as a poker player is where you will play. Cash games? Sit and gos? Multi-table tournaments? The best advice that Blade’s book gives you is his advice to be self-disciplined at all times. Follow a steady pattern, but change when you are ready, based on what you’ve learned. You must follow rules and not play irrationally. Be consistent, even if your actions change from hand to hand. This is mandatory, no matter how much experience you have. Of course you must read other poker books as well. I’m currently reading Super System by Doyle Brunson and I love it. I’ll write a review as soon as I finish. One important thing in almost everything you do is to be positive. Sometimes poker can be cruel! You must review your hands, study your game. The bad run will NOT go away, but you can learn how to handle that. Look for, and accept feedback from more experienced players. If everything in life was easy, what would be the point, right? Adriana Teixeira has been playing poker since 2006. She has Portuguese citizenship but now lives in Brazil, where she was born. She became interested in poker after watching the film “Casino Royale” with her husband, who is also a poker player. She works as teacher and plays poker part time, particularly enjoying playing Omaha Hi/Lo. When she’s not playing poker, Adriana enjoys writing and reading.